This was my favorite so far. EASY and TASTY! Mix room temp butter and sugar till mixed. Add a tsp of vanilla, sifted flour and salt. Take the left-over third and mix with some fruit and nutless granola. I used Bare Fit Granola and picked out the almonds. Once that is done you crumble it on top of the jam. 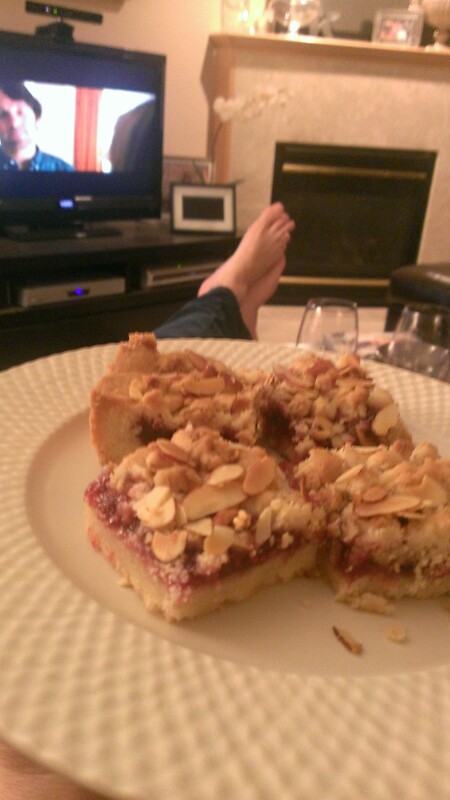 Top with some sliced almonds and bake for 45 minutes. I made these for Dwane and he liked them. I think I ate about 4 the first night. 🙂 you can see it was a lazy evening with some good tv and treats.